Chip & Pepper® is a California lifestyle brand. Foundedin 1985, Chip and Pepper®, launched a fashion line called Chip & Pepper®.The line’s popularity has since expanded to include premium denim, maternity,kids, knitwear, hats, leather goods, and sportswear. Today, Chip & Pepper®continues to embody a rich heritage, founded on functionality, quality and innovation. The brand is recognized as a trusted brand among a globalhighly loyal customer base in fashion, lifestyle and the outdoors. Twin brothers, Chip & Pepper instantly became notorious after they co-founded the successful skate and surf brand, Chip & Pepper in 1985. The brand is recognized globally for being the original pioneer in the premium denim market, known for its vintage denim, its champagne cotton stitching, selvage denim detailing, signature shark tooth stamp and brass shackle from the front left belt loop. 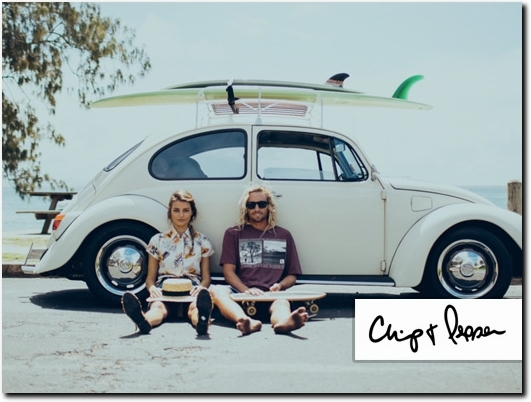 Chip & Pepper balances California surf culture with design practicality that emphasize style, fit, and quality. Chip & Pepper is stylish and innovative brand for people with active lifestyles. US (New York, NY) based business - established in 1985 - providing a range of clothing products. Website includes introduction to products provided, full contact details.